A man at the Pollard Flat river access saw us approaching and looked confused, being that we seemed to be arriving so late in the day. “Aren’t you running the river a bit late?” he asked. “You put in here?” he exclaimed. 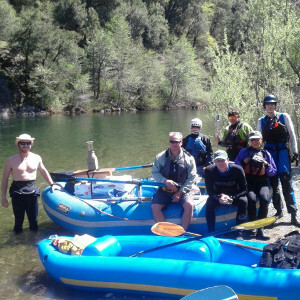 Pollard Flat along the Upper Sacramento River is usually the take out for the popular Sims run, named after Sims Campground, a convenient river access at the beginning of the run. At any flow above 600 cfs, it is a classic run in Northern California. It boasts continuous class II and III rapids for 8 miles. But today we decided to try something different. This morning, Chantal and I arrived at the Pollard Flat river access a bit late. The others were almost ready to get on the river. We asked if we could arrange to take out at Mosquito Creek, being that we did not wish to be on the river as long as the other group, who were planning on taking out somewhere near Lakehead. Our good friend Tim quickly replied, “No. You can’t. You’re going the whole way.” Tim, who has been on river time since about 1969, reminded us of a good rule for river travel: don’t come to the river with a schedule. Be ready to adapt and go with the flow. And so it was settled. We would go the whole way. Dan, Mathew, Christian, Gary, Tim, and Chris were the rest of our river friends for the day. The river is an ideal place for meeting new friends and getting to know old friends better. Christian and Mathew were working on a Google Maps filming project and rigged up a 360 camera on the back of Chris’ raft. His was the only raft, the rest of us were in inflatable kayaks and hardshells. As it turned out, this section of river was perfect for beginner and intermediate kayakers. It was my first day of the season in my hardshell and this was great warm-up run. There were a couple of class three rapids with names like Whitehorse and Tripple Wammy, but most of the rapids had no names that we knew of. That’s how we like it. Once pass Dog Creek, we were in a part of the river run only by a few, probably because shortly after the creek, you enter the remote back end of Lake Shasta. Along this section you will see remnants of Old Hwy 99 and artifacts from the pre-Shasta Dam era. It is here that you will find the Sacramento delta flow gauge as seen on the Dreamflows Daily Report. Since the lake is low this year, it remains a river with many fun class II rapids all the way to the takeout at Riverside, a big rocky bend in the river where the sun is warm and the beers are cold. A perfect takeout.